As a Jewish name the Arabic equivalent of the Hebrew Obadiah and similar names. Its first appearance among the Jews was not due to religious motives. 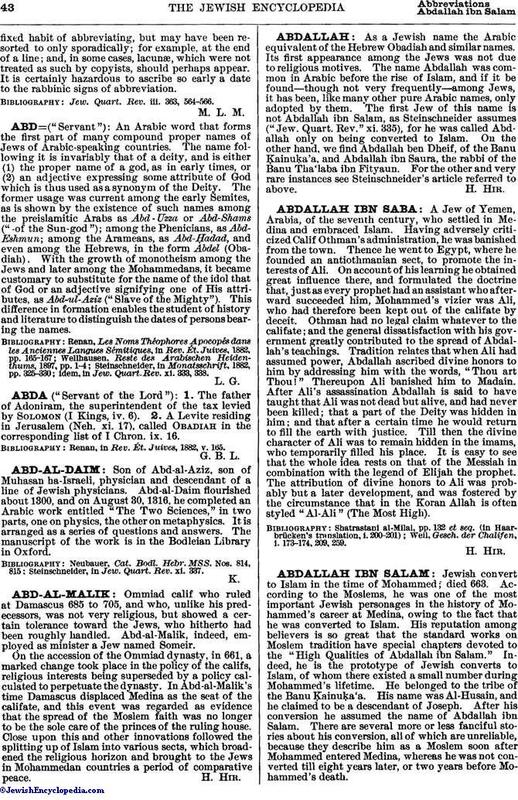 The name Abdallah was common in Arabic before the rise of Islam, and if it be found—though not very frequently—among Jews, it has been, like many other pure Arabic names, only adopted by them. The first Jew of this name is not Abdallah ibn Salam, as Steinschneider assumes ("Jew. Quart. Rev." xi. 335), for he was called Abdallah only on being converted to Islam. On the other hand, we find Abdallah ben Dheif, of the Banu Ḳainuḳa'a, and Abdallah ibn Saura, the rabbi of the Banu Tha'laba ibn Fityaun. For the other and very rare instances see Steinschneider's article referred to above.